Mike Pesca is the host of Slate’s daily news show, The Gist, and the new five-part podcast Upon Further Review, based on his just published book of “counterfactual sporting scenarios.” We sat down with Pesca to discuss turning book chapters into podcasts, the logistics of running a daily show, and asked him a few podcasting what-ifs. When you were writing and editing Upon Further Review, was there an exact moment when you thought, “I should spin this into a podcast”? 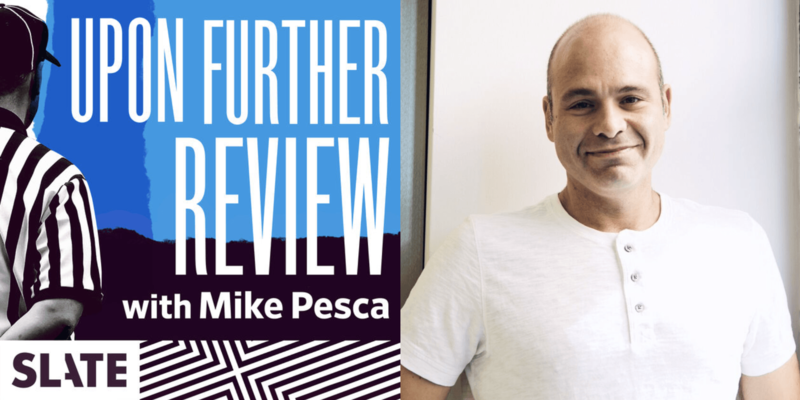 Mike Pesca: When you’re doing what I do every day, which is thinking about a podcast, The Gist, while at the same time generating what ifs, you can’t help but for the streams to cross. Even if I wasn’t doing a podcast every day, I still have the soul of a producer so I think like that. But because I make The Gist every day, I couldn’t help thinking about what the book chapters would sound like as audio, as their own distinct audio stories. Then the idea became inevitable. Was there a chapter from the book you knew you wanted to start with? I wanted to have one really sporty episode, which became episode five: “What if [Tom] Brady hadn’t taken over for [Drew] Bledsoe?” I also wanted to have one that would be totally appealing to my old NPR listeners, who say “I don’t even like sports, but…” — so something that had sports, but was really about something else, and that became the Nixon episode. Once I had those two, I figured we could fill out the rest of the season with a variety of things. What were the challenges for you of turning those stories into podcasts? There was no real challenge because every producer I worked with was great. It’s just that to do a good audio project takes a lot of time. But luckily, I had Derek John as executive producer who got everything together and hired the right producers for each episode. And we have Jonathan Mitchell producing a fictional story written and performed by Jesse Eisenberg. I mean you can’t go wrong, and we didn’t. I was interested in how that episode came to be. Did you know that Jesse was a sports fan and ask him if he had a story to tell? Jesse listens to The Gist, and he came on one time to talk about his book Bream Gives Me Hiccups. We did a story on the show where I played Marv Albert, and he played Jesse, and the conceit was what if Marv Albert was your therapist. So that was satisfying, to act with Jesse Eisenberg. We had a good time doing that, and I said by the way, “I’m doing this book, might you consider contributing a chapter?” And he said, “I might! I will!” I think literally within 48 hours he emailed me the chapter, which just needed a little edit here or there, and then it was born. And when we had the idea for a podcast, I thought it would be a no brainer. Sports podcasts used to sound like radio talk shows, but recently sports narrative podcasts have really forged their own genre. What do you think of this wave and when did you start to think of narrative sports podcasts as a potential avenue for your work? Because of my history with NPR I guess that’s always what I did, and I never thought there was a hurdle to it. 30 for 30 clearly put its flag down and said, “This is what we’re going to do” and was of course wildly successful. And then a bunch of episodes of Malcolm Gladwell’s podcast, Revisionist History, were about sports. So I knew that it was possible. I want to ask you about The Gist. The daily news podcast used to be a very limited space, especially when you started doing The Gist in 2014. But now that The Daily exists and there are a lot of publications and websites with their own. Have you tried to change The Gist accordingly? No, not at all. In fact, I figured out what worked and I’ve been trying to make it better just in terms of what The Gist already is, which isn’t what any of those other shows are trying to do. Up First does three stories and orients you; it’s basically the most efficient 12 minutes of NPR in podcast form and it’s very good. The Daily is also very good, but it’s mostly one big story told via an interview. Today, Explained is a story told by Sean [Rameswaram] in kind of an NPR-feature type fashion. And I’m doing something different. I’m giving you essentially a column at the end with The Spiel; I’m giving you brief thoughts, a little nugget to invite you in, at the beginning, then I’m giving you an interview. No one’s doing that, that’s good. It’s all through my lens. I try not to be oppressive with how much of my opinion you get, but the idea is that you come to hear how I’m looking at the world. And I don’t think any of the other ones do that. At the beginning of the week, how much do you know about the upcoming week of Gist episodes? So there are two types of interviews. Eighty percent of them are banked and we try to get those out the door in five-to-ten days. So we have a shelf of four to five interviews. But sometimes I’ll say, “Let’s interview one of the Arms Control Wonks about what North Korea is doing.” Those we record and post the same day. That’s what we do one or two days a week. So 90% of the time the A segment at the top of the show and The Spiel at the end of the show are conceived the day of. I’m always writing down ideas and putting things on the backburner, but I really don’t have anything written until the day of the episode. What are the daily logistics? At what hour do you have to have The Spiel written, and then when do you record? It’s good if it’s written by 4 or 4:30, but sometimes it doesn’t get done till 5 or 5:30. It’s good to have everything written by the 4 o’clock hour, and then everything recorded in the 5 o’clock hour. One of your hallmarks is being incredibly affable and likable with guests. What are your strategies for making guests comfortable? Some would disagree [laughs]. I’m glad you asked that. There are a couple. First, it’s great that I tape for 25 minutes of an interview before we cut it down to 16. It’s great for a few reasons. It’s great for the Terry Gross reason that you can just take a chance and launch in a direction that might not go anywhere. But the other thing is there’s a whole bunch of questions that just indicate to the guest that you’ve read the book, that you know the book, that you’re quoting something from page 240. I’m cognizant of the moment when they get excited that they’re being asked about something beyond the book’s introduction, which everyone else has asked them about. So that’s definitely part of it. Another thing — and I’m not sure if this necessarily makes them comfortable because it doesn’t happen until we really get into the interview — is that I do a lot of research and I listen to two types of podcast interviews that the guest has done: one that they’ve done on this current work, and also an interview that they did years ago. So with Michael Hayden, I’d heard him do a talk at Oxford, and I asked him if he thought Donald Trump’s cell phone is insecure. His eyes kind of lit up, because, yes, he does think that. knew that he’d talked a lot about phone security in regards to Obama. So I asked that and he gave me a great answer. And then two weeks later I think Buzzfeed had a story about how Trump’s cell phone is insecure. Does that make the guest like me more? Maybe yes, maybe no, but it definitely produces good answers. Last week, Chris Gethard said something really interesting in your interview. He paused to say that he thinks the two of you get along because you both say yes and you’re both basically along for the ride. Is that something of an interviewing philosophy for you? Oh yeah, that’s the best thing. Because you do all your work and you can have all the questions you want to ask, but if you have someone who’s really comfortable going wherever you want to go and they say something interesting, that’s absolutely the best. And this is the biggest cliche, but the best thing an interviewer can do is listen. Great advice. Well, I thought we’d do something fun to close out the interview and I’d throw you a couple podcast what-ifs in the spirit of Upon Further Review. First, what if Ira Glass had a different name? Would it work if his name were Connor Glass? No, let’s say his name is Steve Davis. Steve Davis? Yeah, it’d work. I think his show suffers 4%. Not a lot, just 4%. I mean branding is important, but really what’s Chips Ahoy cookies or The Today Show? These things have terrible names and we love them. But still, in those first few years of This American Life, when Steve Davis is coming to you, it’s not the same as Ira Glass. I think Ira Glass is the perfect name. It is. It’s a classic first name/last name. OK, second: What if Marc Maron didn’t have a garage? What if he didn’t have cats? What if he didn’t have years of therapy under his belt? That’s the biggest thing. I will say, if you want to be totally serious, if his show was exactly the same but the whole thing was “we’re just talking and doing it on crappy mics,” I really think there’s a good chance the show doesn’t take off. It’s all because Maron and his producer Brendan [McDonald] decided, “Let’s do this for real. Let’s make it sound good.” And then Jesse Thorn goes over to his garage early in the process and teaches him about good mics. So without Jesse and without Brendan, and without Marc realizing that the whole thing is more important than just talking to his friends, I think there’s a huge chance the show doesn’t become the show it is. Want to do one more what-if? Sure. What if no one had written a think piece about Serial? What if Serial didn’t have that theme song? Would there ever have been an SNL sketch? It was definitely key to the early success. I’ll tell you what else is key — unbelievably solid reporting!